There are so many different ways to tell someone you love and care about them. 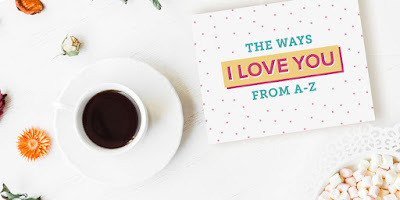 Instead of opting for the typical card, go a craftier route and create an entire book telling them all the ways you love them, 26 ways in fact! Not only does it force you to be really creative, but it gives your partner, kid, or even BFF a list of traits that make them special. And it shows how much you care! Using this Alphabet of Our Love book from Shari's Berries, you can start listing out different reasons your loved one is special to you from A to Z. It helps to write a draft on a separate sheet of paper, before marking up the printable. Once you have your finalized ideas, you can print out the final version on card stock - or even laminate it for a permanent feel! Whoever receives it will treasure it forever!